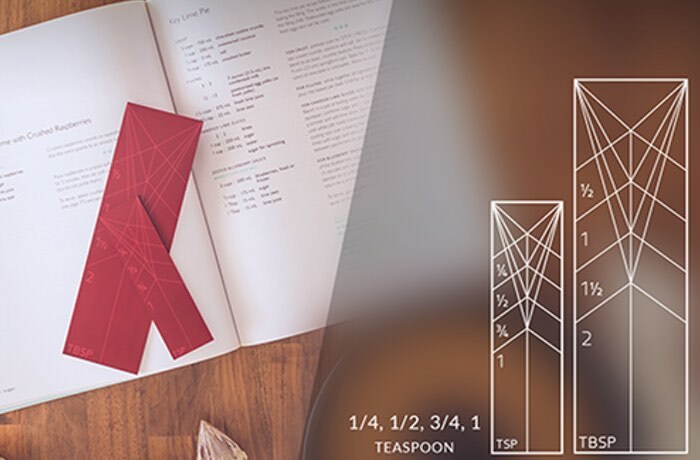 A unique measuring spoon has been created by inventor, designer and teacher Rahul Agarwal which folds completely flat it can be used to measure a number of different amounts by simply folding the correct place. The origami style measuring spoon has already raised over $100,000 via Kickstarter thanks to over 3850 backers with still 39 days remaining’s campaign. Watch the promotional video below to learn more about its unique design that allows it to fold flat when not in use. Polygons is the origami-like measuring spoon that lays flat and folds to 4 different sizes to fit your cooking and baking needs. Premarked areas on both spoon sizes (tablespoon and teaspoon) let you know where to pick up from to measure the volume required for your recipe. The average tablespoon set comes with 4 different sizes tethered to each other with a ring, and if these spoons get untethered, you can kiss finding the one you need goodbye. With Polygons, you are able to find the size you need in seconds, without searching through all of your drawers. Plus, the spoon lays completely flat until you need to use it. When designing Polygons, we wanted to focus on making our product not only durable but also better for the environment than traditional measuring spoons. The hinges of Polygons are made of TPR, which have the property of being able to flex a 100,000 cycles without failure. This means, even if you were to use it 25 times a day, every day, the hinges would outlast 10 years! Additionally, by using the 4-in-1 design, Polygons is eliminating the need for excess plastic and metals that traditional measuring spoons use. For more information on the new Polygons measuring spoon jump over to the Kickstarter website for details by following the link below.